Hop in for a swim, or lounge on the deck and admire the shoreline. All rentals face the ocean, so sit back and take it in. Head to the resort grill for casual lunch and refreshing drinks. A few steps bring you to a beautiful white sand beach. The shops and restaurants of Main Street are a short walk away. 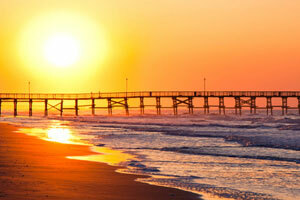 Maritime Beach Club is conveniently located in the Ocean Drive area of North Myrtle Beach. Stop by your condo to drop off your luggage – don’t bother unpacking, there will be plenty of time for that later! Change into swimsuits, grab goggles, pool toys and water wings. Spray everyone head to toe in sunscreen and get ready to hit the outdoor heated pool. Order a cocktail and lunch from the seasonal tiki bar & grill, pull up a lounge chair and get comfortable – you’re going to be here for a while. Once you are fully sunbathed, head to the fitness center to get your cardio on while the kids hang out in the activity room. Challenge the kids to a game of ping pong or shuffleboard. Get in touch with your inner Michael Jordan on the basketball court or practice your swing on the putting green. If the weather is cooperating, take advantage of the bbq grills and have a family cookout. Recruit the kids to help carry burgers, hot dogs, and side-dishes. Then lay out the condiments and toppings and let everyone have at it. All condos are oceanfront. Studio to two-bedroom condos sleep four to six guests. Three-bedroom penthouse condos sleep eight guests. Stop by Food Lion for groceries – your full kitchen won’t stock itself. The kids will be begging to help make your famous chocolate-chip cookies (and be the official testers). And freezers are perfect for storing dessert – fudgsicles for the kids (and a stash of Ben & Jerry’s for the grown-ups). Did the kids end up with chocolate on their clothes? No problem! There’s a laundry facility on-site. Up for a low-key night in? Flatscreen TVs with Cable have you covered. Gather everyone on the couch, put one of the kids in charge of the remote and another on snack duty and get ready for entertainment. Maritime Beach Club is just a short drive to the Surf Golf & Beach Club. The George Cobb-designed course opened in 1960 and was renovated by John LaFoy. Gather all the golfers in your crew, throw your clubs in the car and go. Broadway at the Beach features a variety of shopping and dining options. Surprise the kids with a trip to Build-a-Bear, pick up some new shades at Sunglass Hut – there are three locations! – and bring home a souvenir from Reigning Cats & Dogs for your four-legged family member. Hungry? Restaurants include Dave & Buster’s, Hard Rock Cafe and Johnny Rockets. Take a ride on the SkyWheel, located at the Myrtle Beach Boardwalk. It’s almost 200 feet tall and thanks to the climate controlled gondolas everyone in your party can ride in comfort. Check out Robert Ripley’s collection of strange and unusual artifacts at Ripley’s Odditorium or go on a glass-bottomed boat ride at Ripley’s Aquarium.